„Al di là dell’acqua“ presents 14 artworks by the photographer Massimiliano Camellini. The exhibition is the result of a long-standing photographic project that took place over a period of four years and which examined the interiors of a large number of cargo ships belonging to the companies of various nations. Informed by the literary influences of Novecento by Alessandro Baricco, Camellini’s photographs depict the work and relaxation areas of these small worlds that live mostly on the oceans, far from land and its laws. The project identifies – through objects, symbols and mementoes – the attempt to reconstruct a lost daily life, a semblance of stability amidst constant movement. PR Info _ Camellini’s subjects are the work areas and their objects, but also, and primarily, the private areas such as; cabins, beds flanked by side tables full of memories, tables set for a new meal, and corridors that divide the relaxation periods of these temporary inhabitants. 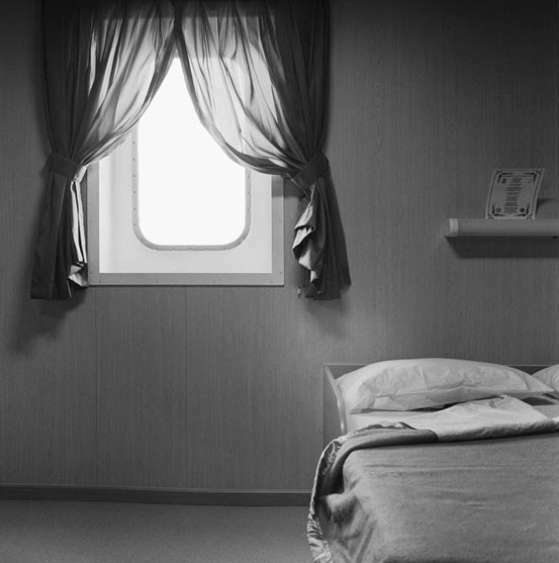 In this labyrinth of rooms, we glimpse a porthole or window, nonetheless as if through a haze, given it has deliberately been photographed against strong backlight and so it becomes impossible to understand the geographical location of the ship. Camellini intentionally separated the interior of the vessel from the outside: two incongruent and oft-irreconcilable spaces. The photographer is fascinated here by the ongoings within this world, how these spaces are organised, the adaptation to new laws and the reconstruction of a personal „shell“ in which to live. People are absent in all of the images but are represented by the spaces and the objects themselves, which await their owners, in a momentary state of suspension. The spaces of the Museoteatro della Commenda di San Giovanni di Prè, which is hosting the exhibition, look out across the old port of Genoa and create an ideal sense of continuity between the images from the project and the reality of the work; the hulks of the cargo ships and the sailors who are its’ subjects. An obligatory port of call in a city such as Genoa, which represents the significance of the changes that take place in this merchant navy profession, in the work of sailors, and at the crossroads of trade and commerce. The work is a dialogue between photography and reality, in a synergy where the confines between the two become ephemeral and deliberately ambiguous. The exhibition is accompanied by a large-format publication, in English and Italian, „Al di là dell’acqua“, presented as a logbook and published by Greta’s Books. In addition to the photographs from the entire project, it also includes a critical introduction by the exhibition curator, Andrea Tinterri, a piece by the anthropologist Fabio Dei from the University of Pisa, and a never-before published story by the writer Donatello Bellomo. The publication is an editorial journey that clarifies the complexity of a wide-ranging project of multi-disciplinary interest.